Comunitae is currently showing how the P2P lending model works to the Spanish community. In July, the first 10 loans were granted, among them very different loan purposes such as office refurbishment or wedding expenses. There have been also many cancelled loans mainly due to insufficient lenders or discrepancies in information. The total volume lent in July was 58,500 EUR (approx. 84,000 US$) at an average rate of 10.36%. It seems Comunitae is starting to work with cautious steps. Currently there are 36 accepted auctions asking for a loan, only one of them is completed, in which there are 61 bids for a 4,000 EUR loan at a 13% maximum rate. . In July there has been 50 working auctions for loans as average, 645 people willing to lend money and 780 firm petitions for a loan, 5,033 users have been registered so far. The cautious approach Comunitae is taking, led to rejection of 70% of the borrowers asking for a loan, looking for a default rate of 1%. Although Comunitae recommends interest rates by ranking borrowers from A to C and maturity with clear rules, lenders decide within a range established by the borrower which is normally higher than recommended by the company. That could show a scarcity of lenders. It seems that this is not a concern to the company – they ask for demanding and selective lenders. Trust is the root of the model and they also developed a groups section where everyone can create or join a group. However one of the groups is sending messages to almost all borrowers to join which could be a spam issue to be dealed by Comunitae or a bad practice to be felt by users and the group to be generally rejected. It seems the group creator wants to advertise his own blog. Comunitae’s Community Manager Millán Berzosa is working hard to show how the model works with a high response from online media as well as Spanish traditional media with interviews, reports or news on a even weekly basis. Coverage is reported on the corporate blog. Jesús Martin Calvo writes as a guest author for P2P-Banking.com covering p2p lending developments in Spain. He just finished his studies in Law and Business. 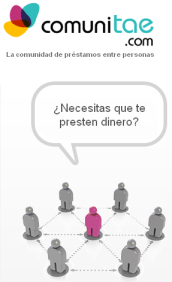 Spanish p2p lending service Comunitae.com has now been one months in beta phase. So far 900 borrrowers have submitted loan applications and 260 lenders have communicated their intention to provide funding for the total of 110,000 EUR (approx. 80,000 US$). One factor named for the success of the beta phase is the high media attention. In recent weeks Comunitae was covered on CNN, Radio Nacional de España, Intereconomía, Onda Madrid Radio Canal Nou, 7RM, Media Capital, Europa Press, El Pais, El Mundo, Expansión, Liberty Digital, El Economista, Cincodías ABC, My Portfolio Investment, Capital, Politics economic reason, which, AVUI, Invertia, Soitu as well as over 50 blogs. It has been said before – there might have been no better time to establish p2p lending. With the established system shaken and many consumers not getting loans as easily as before the market environment is good for peer-to-peer lending. P2P lending gets good media attention. The Uncrunch.org initiative (in which Lending Club takes part) in the Change.org vote for new ideas finished in the Top 15. On the demand site all p2p lending companies benefit from the crisis. On the supply site, in my opinion the effect is mostly positive too, but some lenders are hesitant to invest their money in a new, innovative model and rather seek a save haven for it. P2P lending sites that have demonstrated low default rates over a longer time and therefore low risk fared best – especially at Zopa UK supply rose strongly lately. Pues no sabemos si la crisis es buena para Comunitae, pero de lo que no cabe duda es de que Comunitae es buena para la crisis. Comunitae gets 2 million Euro funding from Entrinnova to establish itself as a p2p lending service in Spain. Comunitae will allow loans between 3,000 and 15,000 Euro for loan terms of 1 to 3 years. The amount that lenders can lend will be up to 50,000 Euro (minimum 50 Euro). Only residents of Spain will be able to use the platform. Founded by José Miguel Rotaeche and Arturo Cervera, both ex-bankers at BBVA, Comunitae aims to launch in mid 2009. The name is derived from “Comuni” for a group of persons and the spanish abbreviation “TAE” for interest rates.